Looks delicious, Was any water added to the mash or will the peppers and liquid seperate when fermenting like they did in the 2nd and 4th photos? Thanks for sharing. The bottom solids are more of a slurry and easily remix into the ferment. That makes a lot more sense to my own pepper fermenting. I’ve been experimenting with a variety peppers (excluding bell) and have noticed that they appear to separate into pulp and liquid however never enough to make the pulp float. Most of the time the liquid just surrounds the mash and the level doesn’t change. I am getting the whitish mould on the surface, I was just going to it skim off then soak remaining pepper ferment in vinegar then strain, drain and enjoy. Do the peppers need to be bright and ripe or can green Jalapenos (and other unripened chillies) be fermented? Green peppers ferment just as well as others. Pepper color or ripeness won’t affect the fermentation process. This is awesome! I love hot sauce and I have no idea why it didn’t occur to me to ferment it! Have you tried not adding vinegar and just sticking it into the fridge? I’m curious if I can get away with just a straight ferment. I’ll probably try it anyway, but if you’ve had horrible luck with it, maybe not. I have not tried the no-vinegar-in-the-fridge option. I keep my hot sauce in the cupboard since the fridge is too full already. And without vinegar, mold grows on top. @Amanda-I’m still fairly novice, but I thought it would interest you that I have made about a half dozen mostly single varietal hot sauces and have never added vinegar to any of them and they have lasted months in the fridge so far. Though I know what Favero means by having a full fridge. I might be interested in trying that sometime, but personally I would rather not dilute the chili flavor by adding approximately 40% of the volume of vinegar. We have been fermenting hot sauce for about a month now, although we haven’t gotten as much bubbling action as you appear to be getting. Is that normal? We see some foam on top, and a few bubbles rising now and then. Perhaps our ambient temps are too low? We like a cool house typically around 64 degrees. The solids have fallen to the bottom and the water is a rich red color. Just not sure if it’s working. Also, what is the longest you ferment them? I’ve read up to a year but that you should put the ferment in the fridge after a month and continue that way. Consider tasting the sauce at intervals during the fermenting process. That will certainly let you know if it’s working. Also, put the ferment in a warmer location and see if things speed up. I generally put my ferments in ‘the vault’ (an unheated room in the basement, under the porch) after the initial 2-week rapid ferment on the kitchen counter. I have juices that are still fermenting in the vault after more than a year. My favorite is radish juice over 1 year old. I cap it after 6 months and let it carbonate. Favero… me too with vinegars! I have some SUPER AGED w/ACV and edible flowers. I hope to get it on the market in 2015. It changes your moods and the cravings for sugar and carbs. But it needs LOTS of time. I also use solar ferments because I live in a high altitude location AND my fermenting porch for solar faces West. It’s very powerful; so powerful that I have to watch it carefully because the garlic (one small bit) molded before I brought it in. I took it out and drank some of the vinegar to be sure it was okay. I’m still using that jar from 5 summers ago! Powerful stuff. It has the potential to end obesity in the USA if I can get investor participation and a really smart FOOD SCIENTIST to work with me. The potential for this stuff is huge, but I’m still working on it and introducing it to a few testers. It’s hard because they have to be dedicated to REAL FOOD and eliminate processed junk food in order to test. Most people cannot stick with it long enough before they get to the point of realization like I did: Wow… I have no sugar cravings and no lust for bread! As the result of this incredible product, I lost weight without even trying. This is the way for people to get healthy, but they have to love the vinegar from the get go so they can continue cooking with it. Anyway, fermenting time does make a difference… and solar is power. Please send me your recipe… I’d like to try it. I started them 4 days ago and there’s been little change. The mixture isn’t separating and I haven’t noticed much water being extracted. Do I just need to be patient? I used 10oz of hot peppers and 16oz of sweet, thicker-walled peppers, though not bells. It was a fairly runny, pourable slurry after chopping in the processor and doesn’t seem to have changed much in consistency. It’s also starting to smell “off” even though I’m stirring every day. The smell is as though it’s going bad, but no visible mold has formed (how can it if I’m stirring every day?). Also, I’m wondering why you only use a “pinch” of salt (1/2 tsp? ), which isn’t very much. Other fermentation recipes I’ve read say to use at least 6% salt by weight and to only use kosher or non-iodized salt. Thank in advance for any advice you can give! Jeff- I have limited troubleshooting experience with ferments. Only two weeks ago I discarded my first fermented juice ever. It was carrot juice. I typically wait to stir fermenting juices until mold appears. It separated and bubbled, as is typical, and when I stirred the first mold that appeared, the juice was very viscous. Thick and mucous-like, actually. Its odor was not disgusting, though it didn’t smell typical of a lacto-ferment. I poured it out. My partner often juices vegetables for drinking, and always gives me a tall serving, which, nearly always, I ferment. So, I add a pinch of salt to what is typically a pint or less of juice, and let it set in a quart jar on the cupboard. After the initial ferment is done, I transfer it to a narrow neck bottle and put it in the vault for a few months (or a year). For a pint or less of juice, and pinch of salt seems adequate. And I favor less salt (except for kraut or kimchee, where too little salt will affect texture, resulting in a mushy product). I’m fermenting some half-gallons of tomato juice and likely used 1 tablespoon of salt. And when I make miso paste, I generally use half the salt of any recipe I’ve followed. Separation of juice and pulp is much more obvious in the juiced vegetables where the pulp is very fine. When I ferment blended peppers, the pulp is more coarse and separation is more subtle. It always happens though, even if it takes more time to occur. I, too, have a question about the white mold and the “off” smell. I began fermenting red peppers about 4 weeks ago (Santa Fe) and one of the jars has no mold but does have an “off” smell, like when my husband’s salsa is going bad. The other jar has both a thin layer of mold (I skimmed) and the off smell. Question: Will this sauce taste good if I strain it? It smells more “gone bad” than fermented. Question: Has anyone tried adding a little sugar to the pepper mix to give the bacteria more food to munch on? Question: Will this sauce taste good if I strain it? Reply: I suggest you strain and taste. Doing so will not affect the fermentation process, and will let you know how it’s proceeding, flavor wise. In fact, you don’t need to strain to taste: try a spoonful and see how it is. You don’t need to swallow it- just put some in your mouth, swish it around a bit, they spit. There will be plenty of flavor on your palette. Question: Has anyone tried adding a little sugar to the pepper mix to give the bacteria more food to munch on? Reply: I have never added sugar to a lacto-bacteria ferment, as yeast are far more likely to utilize the sugar than are the bacteria. So, you might end up with a different community of micro-flora, and perhaps some alcohol content, as a result of the added sugar. So I’m happy to report after trying a few different things to get my hot sauce ferment warm enough, that using a seedling heat mat has done the trick. I read about it on another fermentation forum. It heats the area from 5 to 10 degrees warmer than the ambient temp. It literally “woke” my hot sauce up and it’s truly fermenting as it should have been. I guess I didn’t have the right conditions before. I’m looking forward to reporting back in a few weeks. Fingers crossed! The Red Savina Hab is just about the sweetest pepper in the garden! Why destroy that sweet taste that pops so nicely when you eat a fresh one? Next time, just blend it with a bit of apple cider vinegar, and keep the sugars intact! Most sauce companies ruin the peppers by packing them in brine (salt water) which allows the fermentation. What a disappointment! 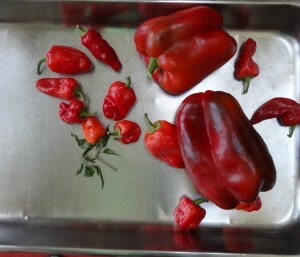 I started fermenting cayenne and red sweet and red thai peppers in October with salt. I left them out in an unheated building after the initial action. I haven’t done anything to them and there is about 1/4 inch of mold on them. I have strained off the mold and they taste good. Is this okay? Or, is the mold dangerous at this point? Surface mold and yeasts are ubiquitous with vegetable ferments. Unless I have installed an air-lock device of some kind on a fermenting food, I expect the molds and yeasts to participate, too. Scrape it off and enjoy the ferment beneath. Is it a problem using the fermented peppers with the seeds? Or is it necessary to strain? Nope, not a problem at all. Depending on the species of pepper, the seeds could contribute to the heat in the sauce. If I blend the peppers, I remove the stems first since they can be bitter. I followed a recipe to make a mash of habaneros, serranos, garlic, and 6% kosher salt around the end of October. It’s been sitting for 3 months. I think I may have used too much salt. I noticed a few tiny bubbles that would suspend in the mash over time, but it never produced enough liquid to float anything. It never grew any mold. It smells and looks fine. My only concern is the possibility of botulism since I never got that awesome super-bubbly fermentation action. From what I understand, botulism doesn’t add anything to appearance or smell. Since this mash never produced much liquid, is it possible it still fermented enough to prevent botulism, or does fermentation need more liquid to work? I’m adding a little vinegar and blending it to a liquid sauce, but I’m thinking about boiling the sauce as well to be safe. Lacto-fermented raw vegetables create an environment that is antagonistic to the bacteria that causes botulism. It is the accumulation of acids created by the fermenting bacteria that out compete, and make an environment that is inhospitable to, the bacteria that make humans ill (like salmonella, e. coli, listeria, clostridium, and botulism). Copious liquid is not required for the fermentation to work. OK, so how does the sauce TASTE? Let us have a wine- or beer-type review, please. Then we took a sip. Queen quickly replied ‘tangy and effervescent’. I get a initial reminiscence of Tobasco’s red pepper sauce, then the tang overpowers that thought, and the heat quickly fills my soft palette. The pepper flavor is light and almost fruity. Then the heat spreads down to the inside of my cheeks and holds there awhile. After we finished the hors d’oeuvres, we continued by simply sipped from the bottle, never feeling overcome by the heat, nor tired of the tang. The pepper flavor is subtle, and has a gypsy-like quality, moving easily and showing up in different places of my mouth, throat and palette. I just wanted to contribute my fermented hot pepper sauce method to the discussion. I mixed chopped jalapeños with salt and cram them into a wide mouth quart jar. Then I take a large slice of something (I’ve used apple and winter radish in the past) and put it on top and use it to press the peppers down (this will eventually hold most of them under the liquid that forms) . On top of that I put a smaller jar (1/4 pint jar) filled with pennies to press down the whole lot. Then I put an un-lubricated condom over the mouth of the quart jar and put it some place dark for 8 weeks. The condom keeps oxygen out and prevents any mold from forming. After 8 weeks I blend up the peppers and the liquid (toss apple – but the radish is delicious) in the blender and poured into clean bottles. It is excellent! I put it on everything. Mexican hot sauce typically focuses more on flavor than on intense heat. Chipotles are a very popular ingredient of Mexican hot sauce and although the sauces are hot, the individual flavors of the peppers are more pronounced. Vinegar is used sparingly or not at all in Mexico but some sauces are high in vinegar content similar to the American Louisiana-style sauces. Some hot sauces made in Mexico may include using the seeds from the popular achiote plant for coloring or a slight flavor additive. . I love Sara Swanson’s method as well as the one posted here. I think they both have their merits concerning flavor. Also, I don’t see that anyone has used a food mill to remove seeds and skins which in, my opinion would help the flavor. However, the peppers may need to be par boiled to process them in this way. I think the companies that make hot sauce may use this metod instead of straining afterward. Does anyone know? I will soon be receiving my continous feed food mill from UPS and perhaps I will try this myself. Also, I think there is a call for the use of a Japanese pickle press (inexpensive). I make salted cucumber and cabbage pickles in mine and they come out crisp and wonderful. Perhaps I need another press for lenghty fermentations. Please let me know if anyone else has used either the press or food mill. BTW, Shirely Haecker’s post has a link to a tour package site that has nothing to do with fermentation. This kind of spam is really insidious and especially annoying. Thanks for taking the time to write this, it’s been very helpful. I find there’s mostly crap on the internet on fermented hot sauces, so this was a breath of fresh air. Quick question for you. I let one of my hot sauces go for a couple days and it took on a different odor. It went from the familiar smell to something a bit more sour–it had a bit of that alcoholy smell you get with rotting fruit. Just wondering: is that bad? Bad, as in harmful. And is there a way of fixing it? No, it’s probably not harmful to eat, especially if you don’t see any competing molds on the ferment. Go ahead and taste it – don’t swallow, just put some in your mouth, move it around a bit, then spit. See what’s happening on your palette. The sour odor is likely the result of a different organism living in the ferment, and I don’t know of a way to erase its odor. Do we need to worry about botulism following this process? I fermented and ate fermented foods for years and never even thought of botulism, let along worry about it, until I began teaching fermenting classes and discovered the enormous fear around eating ferments and getting sick. The only reason I ever think about it is because someone asks the question. The bacteria that produces the toxin that can cause botulism requires an environment with no oxygen (like when using an airlock), and favors a high pH. This ferment uses bacteria that produce lactic acid, and makes the sauce acidic (low pH). Because of the acidity, there will be no botulism-causing organisms in the ferment. Food safety in fermenting can be assured by two very simple guildlines: 1) use traditional methods, and 2) use a successful (trusted) inoculant (if you even use one). Now, to answer your question: Do we need to worry about botulism following this process? No! All other questions can likely be answered in Sandor Katz’s text, where he devotes several paragraphs to this topic. (See The Art of Fermentation). Fantastic recipe! I had so many bhuts because my brother grew a lot but is afraid of them. So he shipped them to me. I had reds and a second picking gave me greens. I changed your recipe and only used bhuts, making red and green separately. I found that you had to chop them up outside and I wished I had a hazard suit. The greens are less dangerous and can be processed in the house. 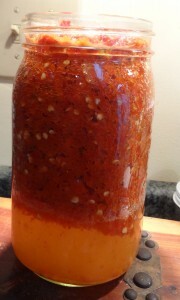 I found it best to cut bhuts directly into glass jar and use stick blender to puree. Both red and green came out fantastic with the green being gentler although still hotter than store hot sauce. The red sauce is very, very hot. I also did not strain and left the seeds in for an extra kick. My brother has started 48 plants for this year but will ship them to me for processing. I am growing a lot less. Ive fermented a bell pepper, cayenne and garlic mash in a salt brine solution. The ferment went excellently for about 7 days then died. I was going on holiday for a couple of days so I stuck the mason jar in the fridge with the intent of dealing with it when i got home. So now its 4 days after putting in the fridge and the ferment has certainly ceased. Should i strain and bottle up or should i strain and add vinegar then bottle up? Taste it, then decide. The fridge will slow the ferment, but will not stop it. If it tastes done, start using it, with or without added vinegar. Or, put it back in a warmer location and let it ferment longer. I am new to fermenting hot sauce and have a couple basic questions. Why not start the mash in a jar with an air lock from the start instead of starting covered with cheese cloth? Are their certain signs to watch for before adding a lid with air lock, or is it just wait 2 weeks? I have seen some recommend boiling after fermenting to prevent botulism, is that necessary or is the low ph good enough? Do you have any tips for sterlizing bottles with small openings? Yes, an airlock at the beginning would work fine. I prefer to stir the ferment as the solids float atop the liquid. Once the solids are broken down by the bacteria (they tend to sink at this point), I install the airlock. That’s just a preference. I have never worried about botulism. I don’t sterilize my bottles, though I wash my ferment vessels, and sometimes I sanitize them. The healthy bacteria of a lacto-ferment keep other unwelcome organisms in check. Boiling your ferment will kill these organisms and allow others to colonize your food. I used an airlock and thought I had left enough headspace but fermentation REALLY kicked off and I’m overflowing all over the place. I’ve replace the airlock and just keep mopping up the mess but I hate to see all of that yummy juice going to waste. At this point am I better off just letting it continue or should I split it into separate batches or does it really not matter? Wait to use an airlock until after the initial rapid ferment is over. You can stir it a couple times a day to help prevent molds from forming, and cover the vessel loosely. A loose lid will also trap CO2 inside, and allow excess to escape. after the ferment process slows, use an airlock for a long-term ferment. I am curious of the amount you got out of just the few peppers. 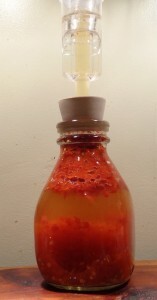 I took 20 cayenne peppers and 2 red bells and the slurry only filled maybe a 1/4 of a quart jar. I just don’t see how you got an entire quart out of only 12 and 2. Not sure at this point if I should add water for more liquid content. Adding some water (or kimchee juice) will easily increase the volume. You’ll need to decide how much. #20 Ed asked about puréed hot peppers in olive oil.#21 Abel asked about botulism using “this” process. It was unclear to me if by “this” he was referring to the oil method or the method already in discussion. To clarify for me, if you would…can puréed hot peppers be safely fermented using olive oil as the only liquid or brine as long as they are covered completely by the olive oil? I have never made a ferment using only olive oil for the initial brine, so I cannot answer your question. 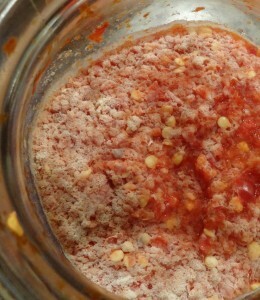 Another newbie question; I’m thinking about adding tomato to garlic and hot pepper ferment for hot sauce. Will this change the method I need to use? And can anyone comment on whether this is tasty or not. @Betsy, I like to keep my chile ferments fairly pure and wait until blending the hot sauce to put in additions. Last gallon batch I blended added a little roasted tomato paste, garlic, a little maple syrup and a small amount of chipotle en adobo for smokiness. I have however been putting in a few crushed cloves of garlic into the ferments, if not at beginning, then a couple weeks later. It makes for a heavenly aroma once the ferment has progressed. I still typically blend a bit more garlic when eventually making sauce. By keeping the mash relatively pure to the chile flavor, it affords the opportunity to make a variety of final flavors when blending. 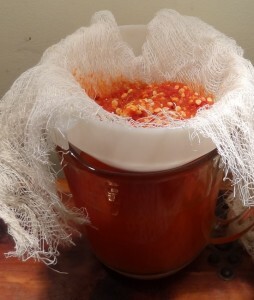 As for adding tomato product to the ferment, I’d suggest experimenting to see how you like it. split your batch into two, one with, one without the tomato product. I’ve been fermenting my chiles for hot sauce for a few years now. Most recently I have about 10 gallons of cayenne and red jalapeno mashes in the style of rushy springs farm (i.e., beginning salt ratio of 2% chile weight, and medium-sweet Gewurztraminer or Riesling). After two months about half the tubs seem to have stabilized and stopped generating surface mold. (well, may also be that winter is arriving in upstate NY and the sun room where the tubs sit is at 50 degrees fahrenheit). I could not make myself throw away the brine from my crock fermented pickles left after pickes were put in jars. I froze it. It has never been heated. Can I use this brine to ferment again this summer? Hello, I’d like to know whether I could forgo the intensive stirring daily process for 2 weeks by placing the mash in a German fermentation crock from the get-go. I tried one batch but it did not seem to ferment. After a while it smelt really bad so I threw it out and have just started another batch. Any ideas where i might have gone wrong? Garry, without seeing/tasting it I could only guess. Either of Sandor’s books has troubleshooting sections, and I suggest you start there. Tried another batch and it is going good fermenting well now in a bottle with an airlock.Thanks. I have had my mash sitting on the counter for 2 weeks already and I have no separation and doesn’t look like it’s doing anything. I did add a little sugar to my mash, will that prevent it from fermenting, I though it would help the process. It could be a very slow ferment, as sometimes they are. Adding kimchi or sauerkraut juice is the best back-sloshing inoculant if you need to add one. Check for tiny bubbles around the top edge of the ferment. Stir and/or shake daily to aerate. Sugar will feed yeasts and some molds, but not the lacto-fermenting bacteria you want to foster. Getting ready to start my first batch. I am pretty excited about it. Do you ever repurpose the mash and use it as seasoning? McIlenny used to sell its mash from their Tabasco sauce. It was awesome. I’ve never tried that, and if you do, I’ll be curious to hear about it. I am starting my first fermented hot sauce. 2 red bells and half a pound of the hottest chills in the world times 2, meaning I want one batch with white vinegar and 1 batch with apple cider vinegar. My question is environment. Where should I store the mash so that it receives optimal conditions. Additionally how much vinegar is added at the end? I generally store my ferments in the dark. Either in a dark room, or a covered/non-transparent vessel. Short ferments, I generally keep in the kitchen at room temperature (65-70 F). Longer ferments, in the vault where it’s cooler (55-60 F). The hot pepper sauce will go well in either. I usually add about 10% vinegar by volume, and store in the refrigerator. I suggest you add vinegar to taste, or, if mold forms while stored in the fridge add more vinegar. i have an abundance of hot and super hot peppers that i have done everything but fermenting hot sauce…. I have never made a fermented hot sauce with stone fruit. The added sugars will attract yeasts and other molds that may not be harmonious with a lactic acid bacteria ferment. I would be more included to add fruit and vinegar after the peppers have fermented, and then either refrigerate or can (seal) the sauce. I had 3 jars of all the same batch of pepper purée. 2 of the jars have very little white mold and 1 is completely covered. Why did this happen? They were all cared for the same and at the same time. Hard to know why that happened. Many of the mold that grow atop our ferments come from the air, and not the fermenting substrate. I recently bottled the sauce I made from fermented chile de arbol, and a little tabasco and habanero. I fermented two months. The results are outstanding. No other ingredients than peppers, salt and water, and the flavor and aroma are just so fantastic. I did not add vinegar, and I keep my sauces refrigerated, and that’s fine with me. I used habanero peppers for my slurry and threw in a little garlic and some wild ramps. It’s been about 10 days and my slurry has been bubbling and fermenting but it has not separated into solid and liquid layers. Does this mean that the peppers didn’t have enough liquid in them, or maybe I didn’t blend the slurry enough? Is it going to affect the fermentation? If the ferment is bubbling and fermenting, nothing is wrong. It will just take more time- eventually, as the solids break down, there will be some separation. Thanks for the reply. Would it help to add a bit more salt? I’ve been making sauerkraut for a whole week now, and it’s coming along great! I’ve also been making a fermented hot sauce. I’ve smoked my own chilies and been making sauces for a few years now, so this new technique is quite exciting for me. Just one question/problem though; The pulp was fermenting really well for about 4 days, and now it has just stopped cold. It’s been a steady 19C inside where it’s been. Any ideas why this would have happened? I’m all set to put in an air-locked jar but wan’t to know what might be going on first. Seal it under the airlock, and you’ll know for certain if it has stopped. If may have simply slowed. At that temperature, it should still be fermenting fine. Thanks for your great site. It is really helpful. My mash doesn’t seem to have come to life, even after 5 days. The temperature is around 20C. Yesteday I added some yogurt whey but still nothing. It still smells like mashed chilli, not unpleasant at all. 2 days ago I put it under an airlock and verified that there is no activity. Any thoughts? I verified that the salt I used does not contain iodine. I am wondering if perhaps I added too much salt. Don’t fret about the iodine. Do fret about too much salt. Does it taste over salty? Too much salt will prevent the ferment you want. I have read from other bloggers that organic peppers ferment more reliably than non-organic peppers do. If you feel the need to add a starter culture, use from another vegetable ferment, kraut or kimchi, rather than from a dairy ferment. I was given some jalapeños and hoping to use this recipe. I was wondering if I needed to strain it at the end? I’d prefer a slightly thicker or chunkier sauce. Could I also add garlic and onion or tomatoes in there at the start of the ferment? If placed in the fridge, will the vinegar still be necessary? There’s no need to strain it, thick and chunky is good. And certainly garlic, onions and tomatoes could be used as part of the ferment – although that sounds more like salsa than hot sauce. Everything in the fridge will eventually mold, it just takes longer. So, eat it up quick or add vinegar. Hi, great site! Thank you for the recipe. I was getting that white mould twice a day and the fermentation seemed to be slowing down so I transferred my two jars of mash into a larger one and added an airlock onto the lid. I think maybe the jar was too big, as the mould is still growing, any suggestions? Better to ferment in a vessel that is nearly full, rather than one only half full. Find a vessel of a size that fits your ferment. Cold temperatures in a refrigerator will slow the mold (and the ferment), as will adding vineger(which lowers the pH, and inhibit microbial growth. If the ferment is slowing, and it tastes good, time to harvest and eat. Hi, I’m a big pepper sauce fan and finally I’m going to try to make my own. I have habanero, golden cayenne, chili, serrano, and tabasco peppers ripening at the moment. My question is if you want to add fruit, where in the process do you do that? I love sauces with mango, pear, orange, and other flavors. There is no step in this process to add fruit. Fruit contains sugar. And lactic acid-forming bacteria ignore sugar: but mold and yeast will love it (which I want to avoid in this ferment). If I had to use fruit, I’d add it when I harvest the sauce, and also add vinegar with the fruit. The aceto-bacteria from the vinegar will love the sugars. Hello again Favero, so the jar has been sitting since August, I never got any separation of the liquid. I know there were bubbles being produced, I just stopped stirring after a month and let it sit. There’s yeast on the top and still no separation. CO2 has almost stopped. Taste it. Don’t be distracted with separation or none, that’s not important. The yeast on top may impart an off-putting flavor, so scrape it off and discard. Your tastebuds will tell you. May be time to bottle and enjoy. Me and my sister ferment the jalapeños whole in a pickling crock with ceramic weights to hold all solids under the water, no stirring necessary, crock with a water trough works best to keeps microbes out. Then blend with whatever other flavor when finished, garlic and onion make good all purpose flavors, then you can put it on almost any ethnicity of food, Asian, Mexican, American, Italian, whatever,I like the idea of using Bell pepper too. BTW, our crock is 3 lbs, I am in the process of starting a batch of jalapeños in it, may throw in some habaneros and other things to top it off cause is not quite full. This method requires making brine, the recipe we pulled out of the wild fermentation book with the salt to water ratio from the pickle recipe, 6 Tblsp salt to 1/2 gallon water. A question about storage of chili sauce. Any ideas how high the risk of chili sauce glass bottles exploding is? For how long would chilisauce (made without vinegar) carry on fermenting and producing gases? Thanks! In regard to this recipe, and in particular reference to #46 above, I ferment mine in a polish crock, and try to get enough peppers to nearly fill the crock. I use 2.5% salt by weight of peppers, and since I use fresh, organic (important) peppers, I never add brine at the start, and only if necessary during the ferment. By d2 I generally have more than enough fluid leached out of the peppers to cover them with brine, and they stay below the weights. I usually ferment for a month or so, then puree and put through a sieve. The remaining pulp can be dried and used as an additive to things like chili, but DO NOT add it to a fry of any kind, as it will give off pepper gas that will be unpleasant. I am interested to hear that vinegar is added to reduce the pH, since the peppers are at a lower pH than vinegar. What is your final pH?